"KANSAI IN LONDON" in 1971 was the first fashion show in London by a Japanese designer. 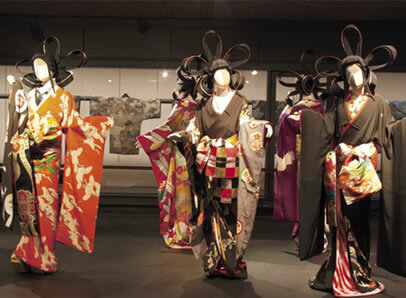 The daring designs, the audacious show direction inspired by Kabuki theatrical technique, every aspect of the show won frantic acclaim, pushing Kansai Yamamoto to the forefront of world fashion scene. The jumpsuits,"Kite", from "KANSAI IN LONDON", allured a broad range of fashion people throughout London with its pop energy. Kansai rearranged typical design of traditional "belabo" kites from Akita Prefecture, patch-working the design patterns together into a jumpsuits, to be worn with front zipper. The design was inspired by the Japanese ancient legend, "Inaba no Shiro Usagi ". 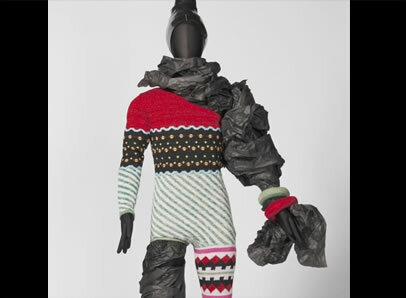 This jumpsuit was introduced in the 1971 "KANSAI IN LONDON ", the first fashion show in London by a Japanese designer. 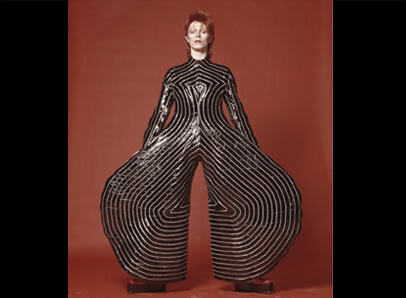 The piece was then worn in 1973 as stage costume by David Bowie during his first world tours, "Ziggy Stardust " and "Aladdin Sane ". Following the raving acclaim for his first show in London, Kansai is approached by David Bowie, through a mutual friend, to create his costume for the prospective stages. Already an icon in England, Bowie was about to launch his first concert in the U.S. and the world tours, "Ziggy Stardust " and "Aladdin Sane ". 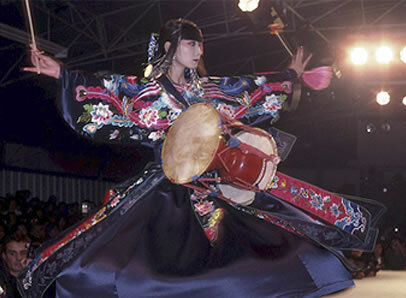 The jumpsuit incorporates a Kabuki "hikinuki " (pull-off) technique. In the concert, a shoulder-neck knitted costume that Bowie wore underneath appeared in just a split second. 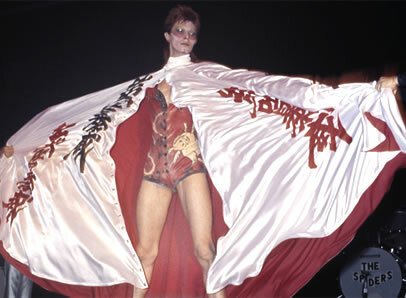 The costume was created for David Bowie's first world tours, "Ziggy Star Dust " and "Aladdin Sane ". Kansai analyzed the most characteristic feature of kimono as "the way different design patterns are layered on top of each other ", which he tried to recreate in a knitted realm. 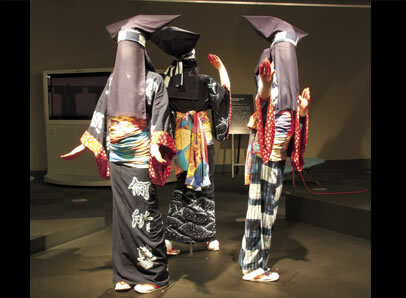 Furthermore, Kansai gave birth to this radical piece with a one-shoulder asymmetrical form. A delicate total balance is achieved with an ensemble of a knitted bracelet and an anklet. At the time, embroidery and knitted pieces of Kansai Yamamoto brand reigned brilliantly in the world fashion scene. The magazine, ELLE France, featured a series showing how to create Kansai brand knitted pieces. Kansai recalls, "We were regularly equipped with a monstrous variety and volume of knitting threads in our atelier ". The two piece work was introduced in Kansai's 1983 Spring-Summer Collection in Paris, worn on stage by Sayoko Yamaguchi. As a fashion designer, Kansai had always been intrigued by an explosive energy in the medium, embroidery. This two piece work was inspired by traditional costumes of the hill tribe people in the Kung Ming region of China. Please note the "Kiryu yoko-buri " embroidery technique (traditional craft in Kiryu City, Gunma Prefecture) used in this work, which Kansai praises as one of the most amazing techniques in the world. 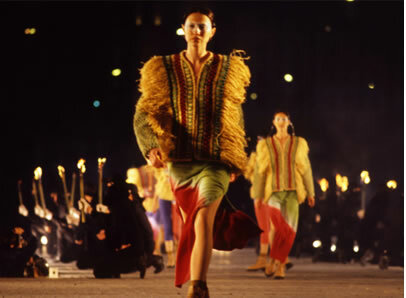 Introduced in Kansai's 1990-1991 Autumn-Winter Collection in Paris. 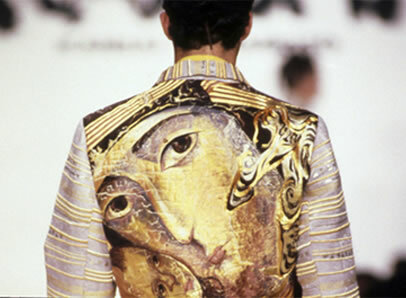 The whole back of the jacket features an intricate embroidery of gold and silver threads with a motif of Icon from the Russian Orthodox Church. Again, Kansai has made the most of the traditional "Kiryu yoko-buri " embroidery technique from Kiryu City, Gunma Prefecture. 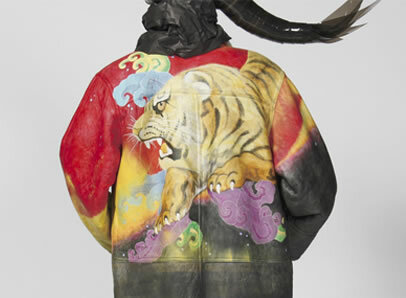 Tiger, wave, and the gradation patterns are hand drawn over the whole coat. Tigers and dragons remain Kansai's favorite motifs. The group of kimonos was produced for the super show, "Abordage ", staged at Nippon Budokan in 2004. The spectacle show was realized after 30 years of planning, overlapping Kansai's own life with the unyielding spirit of Toshizo Hijikata, the vice captain of Shinsengumi, the special forces to the last Shogun. Enchanted by the sublime beauty of the antique kimono colors derived from plant dye, and seeing that the depth of nuance cannot be created with present–day technique, Kansai searched all over Japan for kimonos from the Taisho period (1912–26) and the early years of the Showa period (1926–89) for the "Abordage " costume material. Since the women in those days were much smaller than contemporary Japanese women, the collected pieces generally lacked sleeve and general length on the super-show cast. Two to three pieces of different color and design scheme were taken apart, then put together as one under a new design. Again, the creation is a revelation of Kansai's unbound imagination. The hanten jacket was produced for the super show, "Taiyo no Fune " (the sun vessel) that Kansai produced and directed in 2007, drawing an audience of 42,000 and critical acclaim at Tokyo Dome. Traditionally, banners to indicate a good catch of fish are regular item for celebratory events in fishing villages. 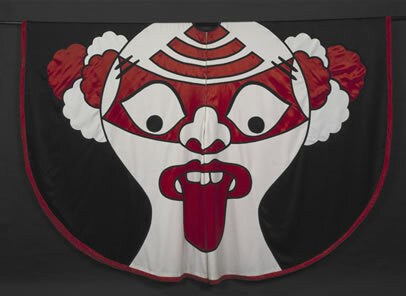 Noting the vivid colors, daring designs and patters on those banners, Kansai created padded Hanten jackets out of them. 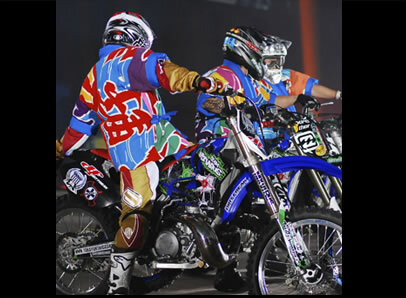 In the super show, six free-style motocross riders clad in those jackets danced at Tokyo Dome in mid-air with grace and breath taking dynamism. The festival costume originally designed by Kansai Yamamoto is a collage of three contentss; the antique fabric created through tsutsugakizome (hand dye using tube device) , and the lyrics from the theme song, "Taiyo no Fune " specially created by Tsuyoshi Nagabuchi, and "Maiwai ". "Maiwai are the banten jackets traditionally given out by ship owners to fishermen at the time of good catch, in other words, "Fishermen's gala attire ". The colorful costume is truly the epitome of Japanese fishery art and culture, unique and unparalleled throughout the world. A variety of designs range from the standard tortoise & crane, treasure vessel, happy old Takasago couple, to a trio of musicians, the vividly dyed celebratory patterns were typical items in fishing villages ". quoted from "Maiwai ", published by Iwasaki Bijutsu Sha. Arimatsu tie dye is the traditional dye style passed on in Arimatsu region of Nagoya city, Aichi Prefecture. Arimatsu tie dye boasts a long history of 400 years ever since the Owari Han, the feudal domain of Japan in the Edo period (1603-1868) , protected it as Han's official specialty products and appointed Shokuro Takeda as Han's contractor. The jacket was produced in 1993 for Kansai's super show, "HELLO! RUSSIA ". The design was inspired by "Shoiko ", the wooden frame back pack traditionally used among farmers in northern Japan. Kansai wove silk threads and fabrics into the jacket, using "Sakiori ", a technique passed on along the Japan Sea coastal region that rips and reuses old kimono material.